This is an unusual tank and one I’m not sure I like. I can see the idea behind it and the audience it should appeal to, but I’m a little nervous. 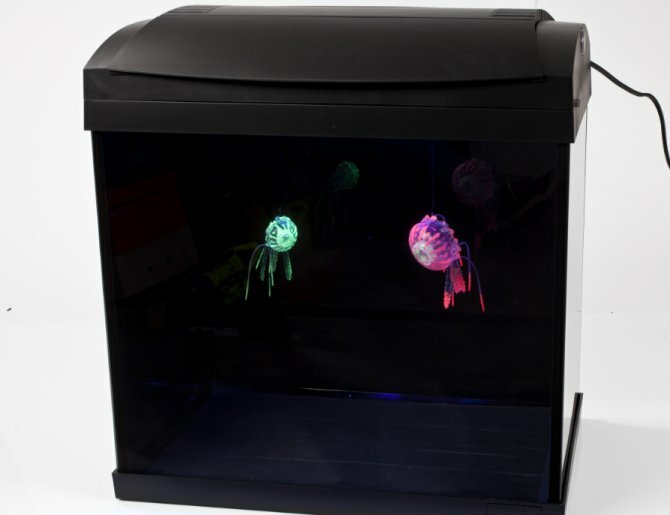 The tank is part of a kit that includes the glass, a built-on hood, filter and a 15w black light — and then two plastic jellyfish. A larger jellyfish and a lionfish are available separately. The idea is that the tank doesn’t house livestock — as far as I can tell — but instead has those jellyfish that react and fluoresce under the black light. So you have a dark tank with a black background and sides and two glowing, artificial jellies. That’s it. The pump moves the water, the jellies wriggle about a bit — and that’s your lot. The jellies and lionfish could also be placed into a normal aquarium, either fresh or saltwater, as ornaments. As a novelty, it’s different I guess, but as something for the aquatic industry, I’m not sure. I don’t really get what it’s bringing to the hobby. This is certainly different for someone who doesn’t want to take the plunge with livestock, or who wants a lifestyle ornament. Although, as an ornament that will need to be periodically topped up it’s harder work than having a lightning ball or lava lamp. It worries me that aquarists may take it upon themselves to add livestock to the tank and, apart from blind cave fish, I’m unsure of any species that could thrive in there. I appreciate that the tank isn’t intended for livestock, but also know that lots of people tend to do whatever they like, and might try it anyway if they get bored of just seeing the jellies. If you’re anything like me the novelty of this product will wear off in no time. I think that within a day of setting it up we’ll have changed the light bulb, pulled the plastic jellies out and just be using it as an everyday aquarium. Price: £79.95, available in the UK from Aquadistri.